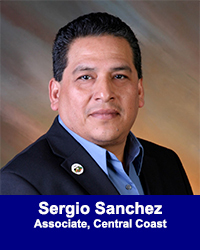 Sergio Sanchez, Associate - Central Coast - California Consulting, INC.
Sergio Sanchez is California Consulting Associate- Central Coast. He will cover Central Coast California. Sergio began his career in public service in November 2002 when he was first elected to serve as a member of the Salinas City Council. Sergio was elected to represent District 1 in the City of Salinas, one of the most diverse and densely populated districts in the city and in the Nation. He was re-elected to two additional 4 –year terms in November 2004 and again in November 2008. From December 2010 until February 2013, Sergio Sanchez worked as District Director for Assemblymember Luis A. Alejo California State Assembly representative for 30th Assembly District.